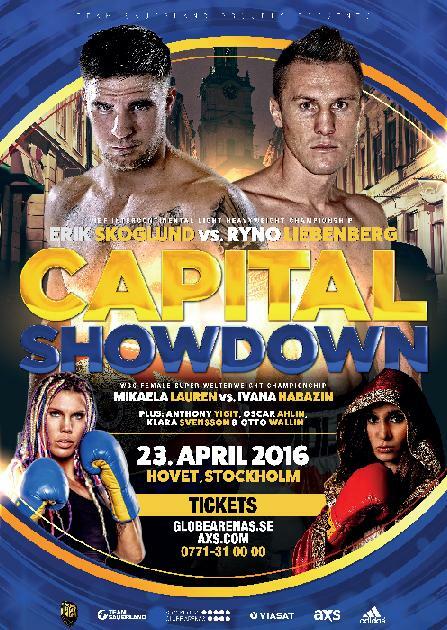 It's billed as "Capital Showdown" and was billed as a defence by Erik Skoglund of his IBF Intercontinental lightheavy title against Ryon Liebenberg. However, it was discovered a few weeks ago that Skoglund had relinquished the title in January. As to why, the IBF said that he didn't want to go through with a mandatory defence. There was no comment from promoter Nisse Sauerland on the matter. But the show apparently needed a title and Skoglund vs Liebenberg is now sanctioned by the IBO with its International title at stake. As for neutral officials, well, it will be all Swedish with Hakan Sindemark as referee and Ake Johansson, Andreas Stenberg and Gudjon Vilhelm (from Iceland but licensed in Sweden) as judges and this apparently accepted by Team Liebenberg.